World Heart Day is an annual global observance organized by World Heart Federation. It used to be held on the last Sunday in September, but in 2011 the observance got a fixed date, September 29. World Heart Day aims at raising awareness of cardiovascular disease (CVD). According to statistics, about 80% of premature deaths caused by cardiovascular disease occur in the developing world. Most of them could be avoided by controlling the main risk factors, such as smoking, alcohol consumption, unhealthy diet, and physical inactivity. World Heart Organization is an international NGO based in Switzerland. It is dedicated to leading the global fight against heart disease and stroke, focusing on developing countries. 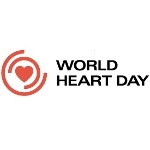 World Heart Organization established Word Heart Day in 2000 to educate people about cardiovascular disease and main methods of its prevention. Word Heart Day activities and events are organized by World Hear Federation in collaboration with international and local non-profits. They include (but are not limited to) screenings, lectures, public talks, sporting events, concerts etc. Each year, a new theme for the day is selected, and participants are encouraged to link their events to the current year's theme.